The Great American Solar Eclipse Part II_Coming into our True Power! Eclipses signify shifts, completions, endings, and releasing along with new beginnings, new directions and openings. Because the Full Moon in Aquarius this month was sandwiched between two Leo New Moons, our cosmic instructions want us to bring our sovereignty, power, leadership, gifts and visions into the world. We need to learn the right way to use personal power. We old hippies learned from Carlos Castaneda and don Juan and don Genaro. This is Queenship and Kingship. We all have personal power, and so we can no longer make believe we don’t have access to power, or reject, misuse or neglect our innate power – to create, to imagine, to help, to love. Learn to let Love guide your use of power. How do we use our power? To control or to contribute? Do we access our power from a place of Love or fear? When we give our power away, how do we reclaim it? How do we ‘stand in our power’? How do we become channels for power? Also, Mercury retrograde will station on the degree of this eclipse, 28* Leo, on September 5th. You might get a hint of what new thing you’ve birthed then. Pay attention to your dreams for these next few weeks. I’ll be hosting a free on-line dream discussion of eclipse dreams in early September. Watch for it. On a psychological level, the Sun symbolizes our identity, our sense of self, our ego consciousness. When the unconscious blocks out that ego-consciousness, we can see two things about ourselves. We can see our Shadows, those parts of ourselves we might be ashamed of, so we project them onto others. But we also get to see our souls—the part of us that is Eternal, and so we see the big picture of the cosmos, which gives us a different perspective on who we are and what we think we’re here on Earth for. This is the big one we have all been talking about. Some of you are determined to be in a place where you can see and witness the totality and many of you will simply be in its energy or see a partial view. …But with that said, this is definitely a time to honor a marker of huge change and the agent of a massive reset. Even if you have been working with these energies now for the past weeks, it is always good to honor the exact time frame around this event. 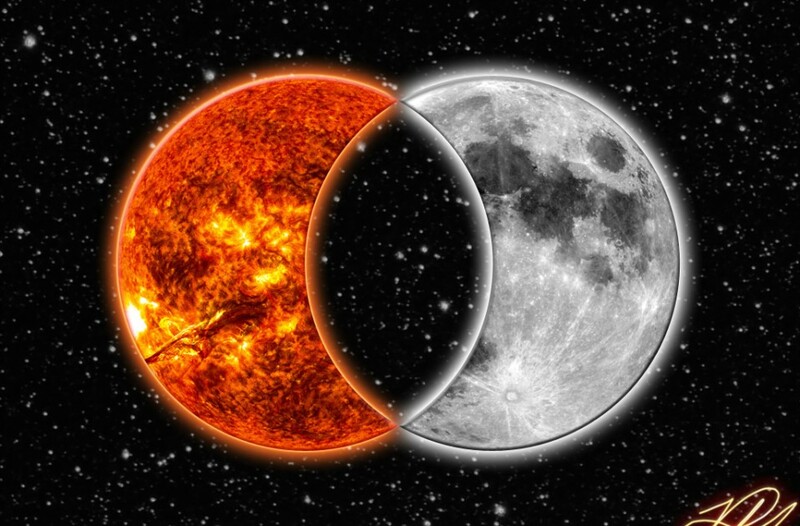 As the eclipse recedes and the sun comes back, imagine that it is feeding and nourishing and energizing a new you, one that has been reset to a new vibration, a new consciousness, a new frequency.